Finmeccanica – Selex ES has received an order from prime contractor Finmeccanica – AgustaWestland to provide a suite of electronic warfare equipment for eight Lynx Mk21A aircraft used by the Brazilian Navy. Finmeccanica – Selex EShas received a contract from Embraer Defense & Security to provide an undisclosed number of Gabbiano T20 radar systems for the KC-390 transport aircraft procured by the Brazilian Air Force. COMSOL Inc., announced the opening of a new office in Curitiba, Paraná, to provide multiphysics simulation and analysis software for the Brazilian market. By establishing direct operations in Brazil, COMSOL can fully serve the region's vibrant high-tech industry and research community. Users of the company’s flagship product – COMSOL Multiphysics – will benefit from local technical support, comprehensive training sessions, and opportunities for on-site seminars and company visits. Thales Alenia Space has signed a contract with Visiona for Brazil’s Geostationary Defense and Strategic Communications Satellite (SGDC) program. 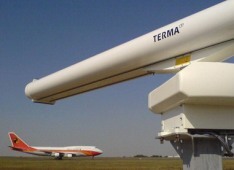 Terma has been contracted by HITT Traffic to deliver and install three SCANTER 5502 Surface Movement Radar systems to Rio de Janeiro and Curitiba airports in preparation for the Soccer World Cup in 2014 and the Olympics in 2016. A consortium of Saab’s subsidiary HITT Traffic, Ambriex and RRJ Engenharia have been awarded a contract to provide an A3000 A-SMGCS at two international Brazilian airports.